This easy-to-read Royal National Park coastal walk map covers the northern and southern sections of the park across two A4-sized pages. Simple to use, this map includes highlights of the track, toilets, water sources, public transport and more. 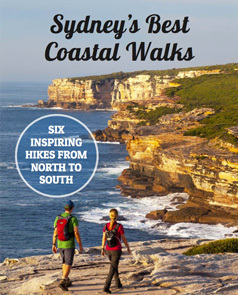 Designed for walkers keen to tackle the full two day Coast Track, this Royal National Park map will also benefit day-walkers to Wedding Cake Rock, Marley Beach, Wattamolla, Burning Palms and any section of the coastal walk. While this map also shows Figure 8 Pools, walkers only planning that single track, rather than the full coastal walk, may prefer the Figure Eight Pools map. 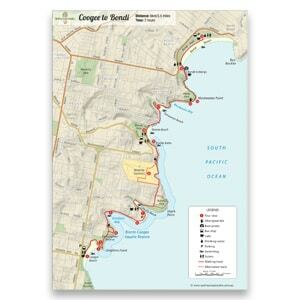 This Royal National Park coastal walk map costs less than a cup of coffee for the whole walk! If you bought the corresponding topographic maps from Land & Property Information, they'd be $20.80 plus delivery, so this map is a huge saving. NPWS no longer provide printed maps of Royal National Park. 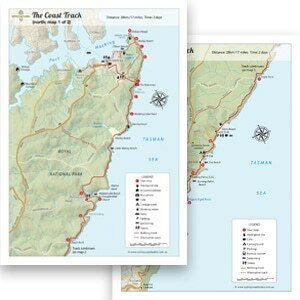 This may be the only place you can get maps of the Coast Track, and has the most information. How will I receive my map? There will be a link in the Checkout page to download the map once your order is complete. It's a PDF file, approximately 10MB in size. You can either save it to your device and refer to the electronic version while walking, or print it out at home on two standard A4-sized pieces of paper. You will also receive a link in the Receipt that is emailed to you.